Planning your shot list and visualizing your story are critical components of the pre-production process. It can be easy to forget, considering all of the planning and thought that goes into what is happening in front of and behind the camera, that the camera itself is the core of any film or video project: the location, orientation, and motion of the camera keeps the audience engaged, and, when combined with editing, facilitates the subconscious visual language of cinema. Secondarily, conceptualizing, planning, and setting up a shot is a painstaking process. You don’t want to wing it on the day if you want to remain on schedule. Your shot list is the game plan for your cinematographer and camera department. Ideally, after breaking down the script, the shot list and storyboard should be created in tandem with input from both the director and the director of photography. If you’re wondering what kind of information is needed to make a shot list, Celtx does the legwork for you. 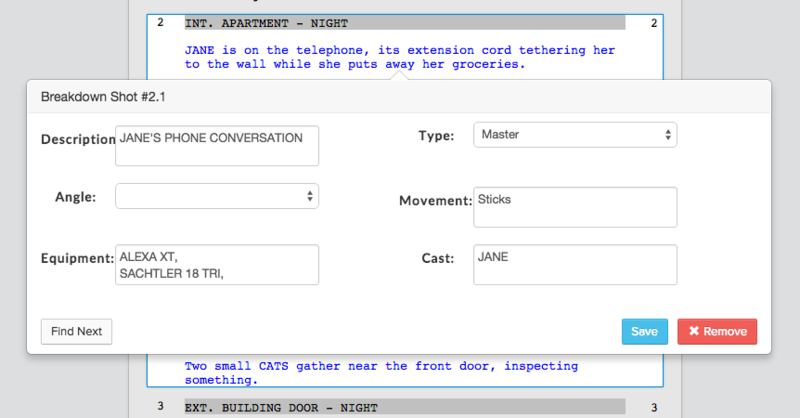 Our shot list feature allows you to plan everything that you need to shoot, scene by scene and line by line. Wide Shots are the first of several types of shots that are based around the relative distance from the camera to the subject, and therefore how much of the frame the subject occupies. A standard wide shot will depict the entire subject in addition to its surroundings. The more the surroundings encompass the subject, the wider the shot is, from Very Wide to Extreme. In an Extreme Wide shot, the subject may appear so small as to be nearly invisible. These shots are typically used to establish the space in which a scene takes place, or to capture broader action in the same frame. Medium shots are the most common type of shots in cinematography. A simple way to think of a Medium shot is to visualize that the subject (say, a human figure) and its surroundings are in relative balance. When the subject begins to dominate its surroundings within the frame, you’re in Close Up territory. Like a Wide shot, Close Ups can be defined by degree. A Medium Close Up, for example, might frame your subject from the mid-thigh and up (the so-called Cowboy Shot). An Extreme Close Up might frame the subject’s face and shoulders, or even just their eyes (the so-called Italian Shot). The Over-The-Shoulder shot uses the head and shoulder of one subject to frame the shot, orienting the camera towards a secondary subject relative to the first subject’s eyeline. This type of shot can be used to communicate proximity and direction between two subjects that are interacting within the same shot. A Cut-In can be used to portray extraneous or secondary elements of a subject in relation to a wider or farther shot, such as the content’s of a character’s hands, or the gun on their hip. A POV shot uses the camera to replicate what the subject is seeing. They are a great way to place the audience in a character’s shoes, so to speak. With an understanding of these basic shot types, you should feel confident in beginning the process of creating your shot list. Remember, more goes into designing the shot than simply picking the frame. You have to take into account the equipment you’ll require, the action dictated by the scene, and the angle and motion of the camera itself. In Celtx, we provide the tools for you easily keep track of these details. With practice, patience, and maybe some field exercises, visualizing your story in filmically appropriate terms will become second nature.